There is nothing more frightening to a motorist than driving down the road with an 80,000 pound tractor trailer bearing down on you at a high rate of speed or cutting into your lane of travel as though you weren’t even there. At times, truckers act as if they own the road. In reality, truck drivers have a responsibility to drive safely at all times, ensure their cargo is loaded properly, and that the truck is in good working order. Federal and state laws govern their driving. A failure to uphold their responsibility can lead to serious, devastating, or even fatal accidents and personal injuries. If you were injured in an accident with a big rig or semi trailer, you probably know all too well the heavy toll it can take on the quality of your life. In addition to the physical pain and suffering, recovering from many of the injuries sustained in a collision with a truck can take months or years, sometimes requiring extensive pain management treatments or spinal surgery. Occasionally, the personal injuries you sustain in a collision with a truck cause permanent damage and impact employment for many years. People who are involved in truck accidents may be burdened with unforeseen medical bills and lost wages that can devastate their quality of life and impact their family for years. The Noll Law Firm, P.C. has represented many clients injured in truck accidents. We have intimate knowledge of the federal and state regulations governing the conduct of truckers. We will make sure that negligent truckers and the trucking companies are held accountable for your personal injuries. While little can be done to make up for the traumatizing experience you have been through, filing a personal injury lawsuit against the trucker and trucking company responsible for the accident may help you achieve some sense of closure or peace of mind. 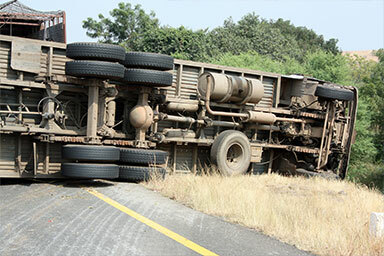 If you can successfully establish that the truck driver’s negligence is to blame for the collision, you may be able to recover money damages for your pain and suffering, loss of enjoyment of life, past and future medical expenses, past and future loss of wages, and benefits. At The Noll Law Firm, P.C., we are committed to helping truck accident victims on Long Island and in New York City establish the negligence of the truck drivers and trucking companies. Our experienced attorneys will work tirelessly to recover what you may be owed. Do not let someone’s negligence devastate your life and livelihood. We will take every step to maximize your financial recovery whether by trial or settlement. Our firm believes that our clients deserve committed, compassionate, and earnest counsel. If you want aggressive, diligent, and personalized representation in your personal injury claim caused by a truck accident, then contact us for a free consultation. What kind of compensation would I receive in an auto accident in Syosett, NY? What’s important to know if you are involved in an accident on the Long Island Expressway?